MK Amir Ohana blasts Blue and White leaders: They called the prime minister a traitor and that continues even after the elections. MK Amir Ohana on Thursday said he is proud of the Likud's historic achievement in the election and criticized Blue and White leader Benny Gantz, who refuses to call Prime Minister Binyamin Netanyahu and congratulate him on his victory in the elections to the 21st Knesset. 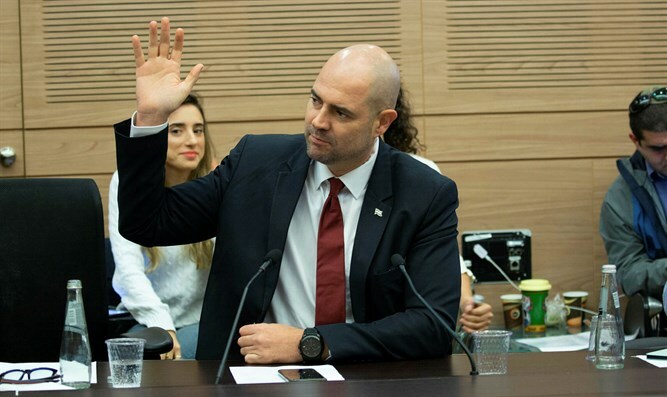 "This is a historic victory for Netanyahu, who received the largest number of seats since he began running, and this, of course, attests to the great trust that the public has in Netanyahu," Ohana said in a conversation with Arutz Sheva. "There were many powerful factors and media visibility and the only reason we did not get more seats is really those influential factors. If you look at the economy that is growing when the world is in crisis, at unemployment which is at its lowest point and at tourism which is at its peak, along with the strengthening of security, where we are in the top ten, and at the foreign relations that have certainly never been better with the two superpowers, the US and Russia,” he continued. Ohana expressed hopes that the New Right party would pass the threshold and help increase the power of the right-wing bloc. "The public does not see shouts and disturbances as a positive thing, and you can judge that based on the shouters from the last Knesset and where they ended up. The public prefers ideological struggles, and I think that when it comes to this, Yair Lapid cannot really threaten Netanyahu,” said Ohana. "They always preach about statesmanship after calling the prime minister a traitor or on the verge of treason and a thief and corrupt and a liar and what not. I did not see even a bit of statesmanship on their part and it has continued even after the elections. I assume that after the final results are announced, there will be no choice and there will be pressure from his people and the media, and then Benny Gantz will call to congratulate Netanyahu, but it will be nothing but lip service,” he added. Ohana hopes to be appointed a minister in the next government. "The decision in the end on who will be a minister in the government is that of the prime minister. In my estimation he knows how to evaluate my abilities. I hope to be in the government and even if not, I will continue to serve."